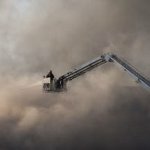 Rescuers in Armenia have to fight nature and technogenic disasters very often. For instance, on December 7, 1988 the north part Armenia was struck by an earthquake magnitude 6.7. Many buildings (including hospitals) collapsed. Rescuers along with volunteers from the Soviet Union helped victims. Although 25,000 people died, thousands were saved by the rescuers. Rescuing campaign lasted till the end of December, when all survivors had been pulled from the fallen buildings. All people, who chose rescuing others as their profession, know how difficult and often dangerous their job can be. But this doesn't make any obstacles for rescuers do their duty everyday and in any circumstances. Job that is done by Armenian rescuers is appreciated on Rescuer's Day on official level.